Lillian Axe is in my opinion one of the most overlooked and underrated hard rock bands out there, and their brilliant "Poetic Justice" and "Psychoschizophrenia" albums have never received the recognition I feel they deserve. I think they hit bulls-eye with those albums, and therefore it was with much anticipation I put their new album on. But I can't say my expectations were met at all, sure they have hit the board with this one but it is surely a bit off the mark. Gone is some of the energy and intensity and we are left with a rather pale version of old times. The signatures and trades are very much still present but the magic has been lost somewhere down the road. 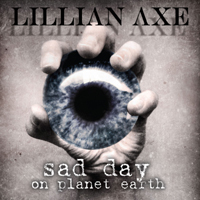 Songwriter Steve Blaze has created better material in the past, and the real highlights are too few and far between on "Sad Day on Planet Earth" for me to fully support their own words: "Lillian Axe is back and the girl has an axe to grind...". For that they need to grind out a higher level of songs and write more catchy rock tunes like they did earlier on in their career. Still a solid release that surely brings back a lot of good memories but it never fully lives up to the potential I know they have.